Jamie Oliver's Crunchy Garlic Chicken is the first chicken dish I ever made, and I was very pleased with the outcome. It did have a little crunch and was deliciously garlicky with a tangy bite. It can be even more flavorful with a sprinkle of dried basil. One (1) clove of garlic Note: This garlic lover opted for three small cloves instead! One (1) lemon Note: When I cooked the dish for the third time, I tried to substitute the lemon with six (6) pieces of calamansi. It turned out more sour but just as yummy. Six (6) saltine crackers Note: I used Skyflakes--how very Pinoy! Peel the garlic and zest the lemon. Put your crackers into a food processor with the butter, garlic, parsley sprigs, dried basil, lemon zest and a pinch of salt and pepper. Whiz until the mixture is very fine, then transfer the mixture to a plate. Note: My kitchen is still very old-fashioned; I used a mortar and pestle. It's very time-consuming, though, so that food processor is next on my shopping list! Sprinkle the flour on another plate. Crack and beat the egg in a small bowl. Lightly score (slash) the underside of the chicken fillets. Put a square of plastic wrap over each fillet and bash a few times with the bottom of a pan until the breasts flatten out a bit. Note: You can get creative with this one; using a rolling pin would yield similar results. 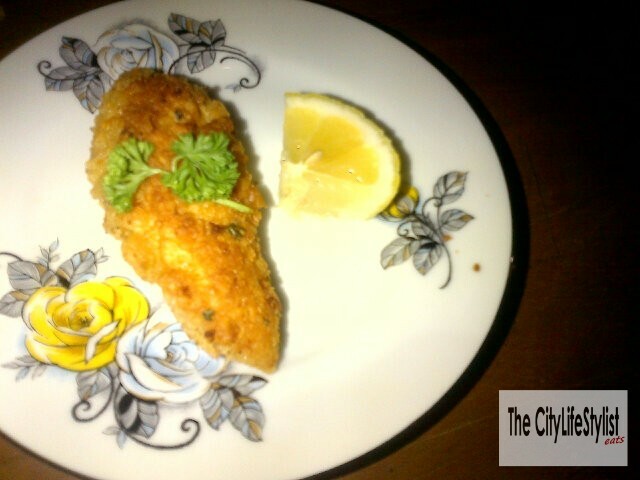 Dip the chicken in the flour until both sides are fully coated, then dip in the egg and finally, in the crumb mixture. Push the crumbs into the chicken fillets until they stick and completely coat the meat. Note: I let each fillet stand to dry for three to five minutes before putting them in the pan because if it's still a bit wet, the mixture tends to slide off while cooking. Serve the chicken fillets whole or cut them into strips and pile on a plate. Serve with a lemon wedge for squeezing over and a sprinkle of salt. Note: Sprinkle some dried basil as well. This dish is already great eaten alone or with rice, but Jamie suggests pairing it with a salad or "simply dressed" vegetables. See Jamie Oliver's original recipe here.